The whole skincare regime, double cleansing and hot muslin cloths still does phase me, I only learnt the true importance of a proper skin care routine once I had acne which was duly caused by not cleaning and looking after my skin properly. I think I’ve come a long way since back then, but I still do suffer from regular break outs and live in fear that my acne will one day return, so I’m constantly looking for more ways to improve my skin. 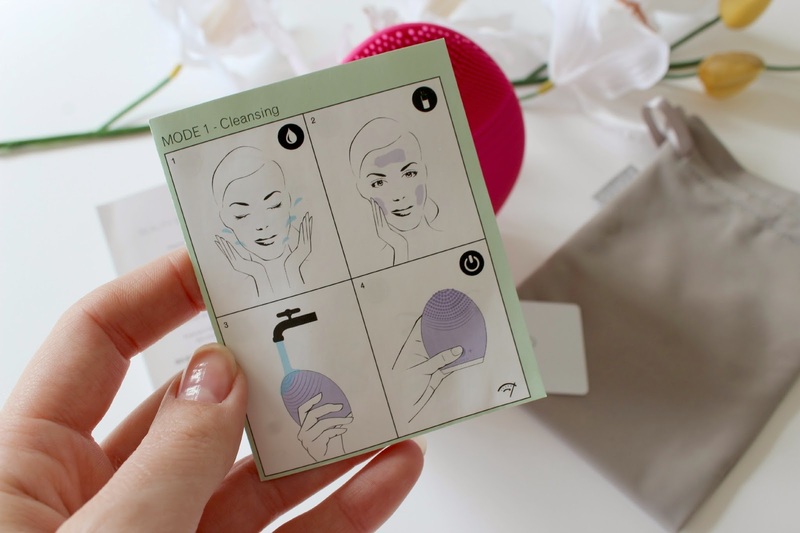 I have heard a lot about facial cleansers from other bloggers so when Look Fantastic sent me the Magenta Foreo Luna Mini* RRP £99 (exclusive to Lookfantastic) to try out I couldn’t let my skin miss out on this fabulous looking device. They also come in 4 other gorgeous colours, the pastel blue and pink Luna Minis are to die for! So what exactly is the Foreo Luna Mini and how is it different to other facial cleansers? The Foreo Luna Mini is a smaller version of the original, and it is a T sonic facial cleansing and and ageing device which promises a mini facial with every use. It aims to cleanse much more efficiently than by hand, remove 99.5% of dirt, oil and makeup residue, reduce the appearance of wrinkles and help to achieve smoother looking and more radiant skin. The reason that this is different to others on the market is that NO replacement brushes are needed, it’s ultra hygienic and it is waterproof, it only needs to be charged once every 7 months and because it’s mini you can have a facial wherever you travel to! It all sounds pretty amazing right?! Step by step cleansing instructions, if you’re anything like me you’ll always pick the simpler version with pictures. But there is a full sized instruction booklet included too if you want to learn the ins and outs of the device. 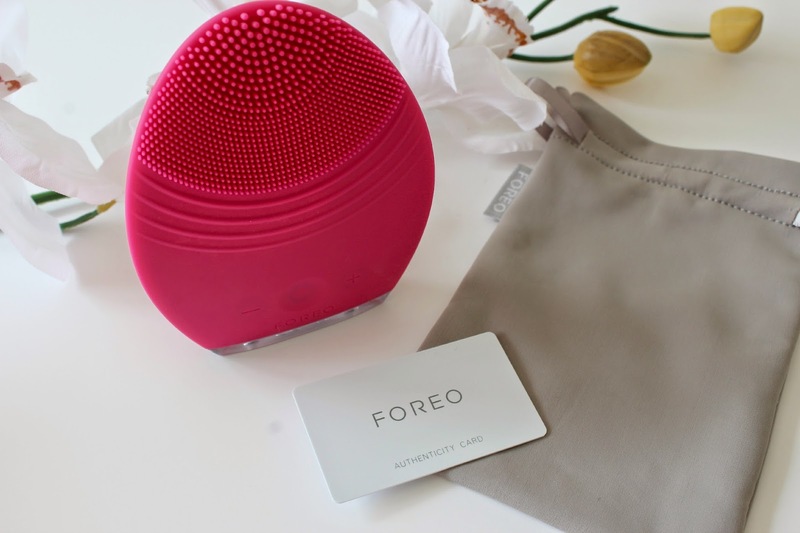 How do you use the Foreo Luna Mini? The Luna Mini is incredibly easy to use, once you’ve charged it up you don’t need to worry about it for another 7 months, I actually charged it by the USB port on my laptop! You simply press the middle power button on the device and away you go, it’s that easy. 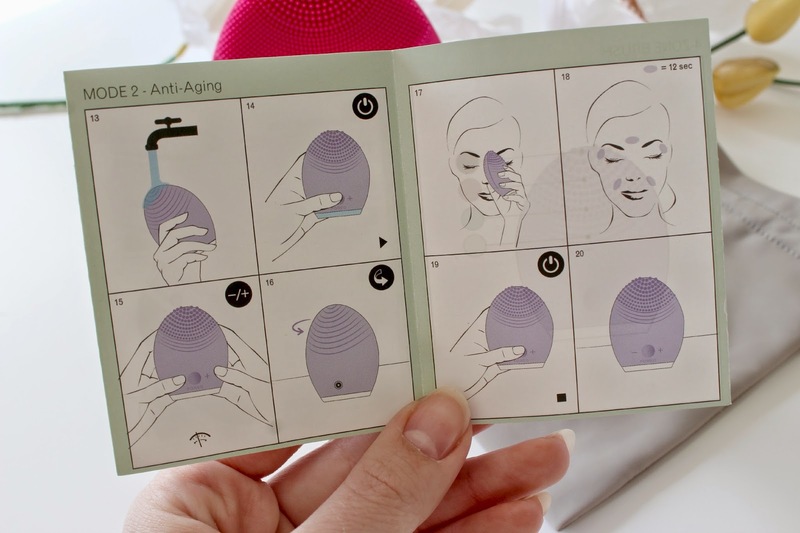 The little instruction booklet is incredibly helpful as it outlines how many seconds you should be cleansing each area, the pulses then take a quick pause every 15 seconds as an indicator of when to move onto the next area so you don’t over cleanse a specific part of your face. It pauses 3 times when you’ve reached one minute of cleansing your entire face, it’s truly ground breaking stuff! As I mentioned before there are two sides to the device, but the cleaning brush surface is the most technical if you like..The silicone brushes don’t collect dirt like normal bristles so its super easy to clean. The device can be used for all skin types too, the top bristles are for those with more sensitive skin whilst the smaller/finer looking ones are perfect for use on oily/combination skin. After cleansing your skin you simply wash your face with water and pat dry. So what is the Foreo Luna Mini actually like? I am always 100% honest in my posts regardless of whether something has been gifted to me or not, as you’ll know from the Click N Curl review.. But I cannot imagine my life without my Luna Mini now, it has truly changed my skin care regime. Before I began using it I was dubious, as I know from other devices on the market that people had said they are too harsh, caused break outs and even broken capillaries. But, comparing this between another market leader I can see why it could cause that and these two devices couldn’t be more different. The Foreo is so gentle and it charges up to 8,000 pulsations per minute which are very gentle, nothing harsh here. I have been taking my makeup off first with the above cleanser with a muslim cloth and hot water. I then massage another layer of cleanser on and let the Luna Mini do the rest. I haven’t used the anti ageing side as I’m focusing more on getting clearer skin but have been using this twice a day in conjunction with the new cleanser Cetaphil as used by Amanda Holden, I started using it with the Luna Mini and have been so impressed by it too, it’s great for those with sensitive and spot prone skin. I have been using it for almost a month now and although I haven’t had ground breaking results yet in the skin department my skin is no worse and it is definitely a lot smoother. I have had a few spots pop up here and there but I always do anyway, it seems to be clearing out the rubbish in my skin first which will hopefully lead to better, more clearer skin in the future. Just by adding it into my skincare routine I feel like my skin is so much cleaner after taking my makeup off for the day and it really does feel like a mini facial in a minute. For that reason I could not stop using this device now as my face would just feel too dirty without it! However, I do feel that I need to use this for a few more months to get a more accurate picture as to how much it’s helped my skin, but the first month has been fabulous and I cant bear to live life without it again. 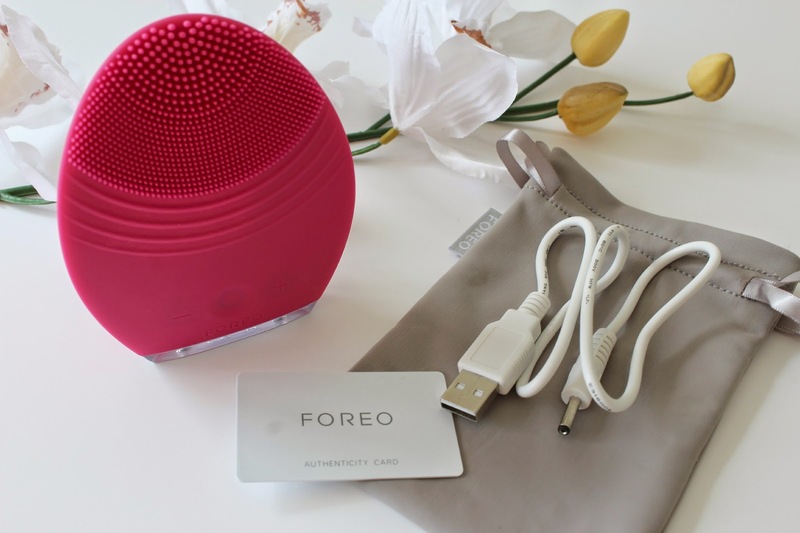 Have you used the Foreo Luna Mini? Do you use facial cleansers? Would you like to add this into your skin care regime? Whats your favourite cleanser?